"First Baptist Church, Providence, R. I. Founded by Roger Williams in 1" by Berger Bros., Providence, R.I.
First Baptist Church, Providence, R. I. Founded by Roger Williams in 1638. 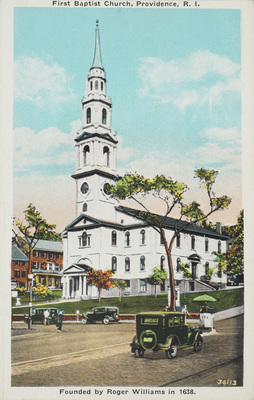 Berger Bros., Providence, R.I., "First Baptist Church, Providence, R. I. Founded by Roger Williams in 1638." (1935). Rhode Island Postcards. 67.